Check OUT/IN, with overdues, fines, reserves all on one screen. Add a BAR CODE SCANNER and labels to your collection for speedy bar code checking. Patrons can be checked using Bar Codes or alphabetic name lookup. Assign each item one of three loan periods/fine rates. 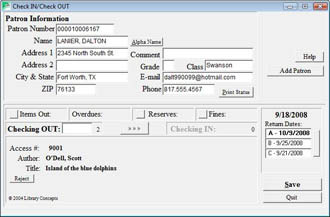 Due dates and fines are automatically calculated as each item is checked out and in. Check In or Recheck a batch of items at one time. Print a patron's "status" (items out, overdue & fines) as they are checking out. Use receipt-type printer to create "bookmarks." NEW!! one-click cataloging! Type or scan the ISBN, click the "qLOC" button and watch in awe as your entire record is instantly filled in. Data (including Dewey classification) comes from the Library of Congress catalog... over 14 million items! Distinguish groups of users by CLASS or FAMILY. Our famous One-day Inventory feature reconciles items on the shelves with the items checked out to discover missing and misshelved items. Stunningly efficient! Print Patron address labels in alphabetic or ZIP order. The USAGE LIST shows how many times each item has been checked out and its most recent check date. The perfect report for "weeding." Check OUT/IN, with overdues, fines, reserves all on one screen. New orders receive 90-days of Support: unlimited phone; prioity e-mail; updates on CD mailed to the library. After the initial 90-days, a modest annual renewal is only $95/year. Seamlessly integrated into PC Card Catalog BASIC, CIRCULATION adds the superb Check Out and Check In features that continue to set it apart from competitive library systems. The Check In and Check Out activities are on one screen where the librarian can switch between the two functions with a click of the mouse. Check Out: Recall a patron by scanning a card or using the handy alphabetic name look up. The patron's entire status (Items Out, Items Overdue, Fines and Reserves) are instantly displayed. Check items out using the bar code scan or Accession Number entry. A new Patron can be added on this screen and can immediately Check Out. Download free, 30-day DEMO and see if it is right for your library. Check In: Scan an item's bar code or enter its Accession Number. The item's return status (on-tme or overdue) is displayed with any fines automatically calculated. The patron's status (Items Out, Items Overdue, Fines and Reserves) is also displayed. Deal with Fines immediately or continue to Check In creating Fine records for later resolution. A Checked In item can be Rechecked immediately with a press of the Recheck button. Switch back to Check Out with the click of the mouse. Items may be Checked Out for any one of three loan periods (defined by the librarian.) Each item is assigned its default loan period during Item Entry. With a click of the mouse, the loan period may be switched to one of the other Due Dates. (The librarian can also create a custom Due Date.) Occassionally, it may be useful to alter the Circulation Date which is convenient to do on any of the Circulation screens. 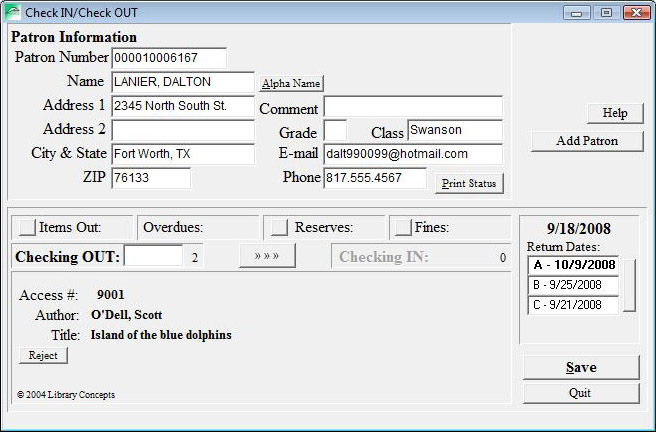 When a Patron's information is displayed, the librarian can list on-screen the items out and items overdue. From this list one or all of the items can be Rechecked or Checked In. Similarly, a list of the Patron's Fines can be displayed and cleared (paid) one at a time or all at once. Add Reservations on the Check Out/Check In screen. PC Card Catalog references Titles when looking for reserved items. Therefore, any returned copy of an item can fulfill the reservation. The Reserves feature can also distinguish between various media types with the same title. Overdue Notices can be printed on postal card stock for easy mailing or onto letterhead for envelope mailngs. The notice can include Fines, Overdue items or both. Similarly, notices can be e-mailed saving the delay and cost of traditional mail service. .
A powerful Circulation Statistics list can be printed or listed on-screen. The list will show the number of items in each Classification group plus a total of items in the collection, the total number of check outs and the total number of different items checked out. Set your time period for your reports. A new Item Usage report lists the total number of times each item has be checked out. The last check out date is also maintained. This report is invaluable for determining items which should be removed ("weeded") from the collection. One of the most useful features is the Inventory. Use the quick scanning feature to add items on-hand to the Inventory list. Print the Inventory Reconciliation List to reconcile items checked out with items found on the shelves. Discover items that are missing or are misshelved. More features than we can describe here... Download free 30-day DEMO and discover how PC Card Catalog can work for you.